Manchester United striker Romelu Lukaku’s injury worries look set to continue as he has reportedly been missing from training today. 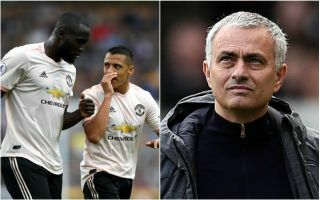 The Belgium international was not involved in the weekend win at Bournemouth and Jose Mourinho revealed afterwards, as quoted by ESPN, that the forward picked up an injury in training. Lukaku has not been at his best recently anyway so could perhaps do with the rest, but it’s far from ideal preparation for United ahead of such a big game. Romelu Lukaku is not training with the Man United squad at Carrington this morning ahead of game against Juventus tomorrow. Fellaini and Valencia part of the group. Rob Dawson reports that Lukaku was not seen training today as United prepare to take on Juventus away on Wednesday evening in what looks a crucial game for their Champions League hopes. MUFC lost 1-0 at home to the Italian giants last time around, and were very much second-best throughout that match. That result followed a 0-0 draw at home to Valencia as well, so fans won’t exactly be confident of qualifying from their group with tough away games against Juve and the Spanish giants to come. While Lukaku hasn’t been firing of late, United don’t have much in the way of backup up front, with the likes of Alexis Sanchez, Anthony Martial and Marcus Rashford now needing to step it up in terms of contributing goals.